A Blood Seduction is a terrific start to a new series. Palmer weaves together two separate worlds, our world and the world of Vamp City, flawlessly. Be warned that this book is extremely dark. It is not for the faint of heart or those who have weak stomachs. There are some very intense, graphic, and disturbing torture scenes. The vampires in this novel are extremely evil and pretty much soulless. There are a few exceptions, but none of them are actually good. However, if you can stand the torture scenes and sheer darkness of the book, the story is amazing. It's full of mystery, action, romance, intrigue, and well-developed characters. I can't wait to see what happens next in Vamp City. A Blood Seduction is told from various limited third person POVs. Somehow, Palmer manages to do this and still maintain an air of mystery around Arturo and his true intentions. There's a sense of urgency throughout the entire story because you don't know if Quinn's going to live from one minute to the next, and she's a likable character. Also, you don't know if Arturo is going to screw her over or be a knight in shining armor. The whole thing leads to a lot of frustration, but also the inability to put the book down. I read this all in one setting because I had to know what was going to happen. To me, that's the mark of a good book. All of the characters are well-developed, although extremely flawed. It's easy to tell who the narrator is following because of the very distinct personality traits of the characters. Also, the narrator's voice changes with each character change. It's almost like free indirect discourse, but a little more defined than that. I'm so torn over how I feel about Arturo. I can't decide if I like him yet or not. On the one hand, he's a very compelling character who obviously has some good in him, but on the other hand, he's such a freaking snake that I can't trust that he's actually going to do anything good in the long run. I almost like him because of my conflicting emotions about him. I would like to see more of his good side in the future, though. Quinn is likable and easy to relate to. She has unwavering loyalty, but a few self esteem issues and a bad temper. I like when characters are flawed. It makes them more realistic. The story follows Quinn the most, but slips into Zack's and Arturo's POV sometimes as well. 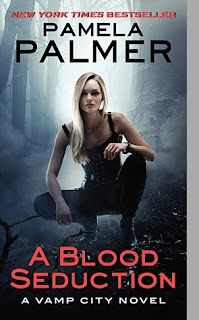 The world Palmer created within Vamp City is intriguing and fascinating. The rules are clearly defined, but because no one is ever honest, it's hard to know which rules are actually true and which ones were made up to give people a false sense of security. An idea of an alternate universe that's stuck in the past and exists over our world is an interesting concept. The fact that some people can pass in between the two worlds and that people go missing because they are getting kidnapped and brought into the other world is even more fascinating. Palmer puts in some nice details about the landscaping, too, such as only dead trees can grow in Vamp City. And it's either dusk or night time... never full daylight. Also, even though Vamp City was created in 1870, it seems to be a mash-up of various time periods. Events like the Games and the banquets that are held and everything are throw backs to earlier times. The pacing for the story is spot-on, and there is never a dull moment within the plot. The entire plot is filled with action, adventure, suspense, and/or romance. The ending wraps things up nicely for this novel but leaves room for a sequel. It's not a cliffhanger, though, thankfully. However, the closing phrase has made me impatient for the second book, which is ridiculous because this one isn't even in stores yet. I have a long wait ahead of me! Overall, I really enjoyed this book, and I can't wait for the sequel. I'd recommend this book to fans of Patricia Briggs, Kelley Armstrong, Laurell K. Hamilton, and Kim Harrison. It's a bit darker than most of Briggs', Armstrong's and Harrison's work. However, if you can handle the torture scenes and really really evil bad guys, then you'll love this book! Want to pre-order A Blood Seduction? Disturbing torture scenes :D It must sound crazy, but I do like to read that stuff, haha. I think that vampires are supposed to be that way! No fluffy, cute, sparkling vampires. No, the manipulating creatures ^^ I'm going to check this one out, thanks for the awesome review! I've not yet read anything as dark as what you describe, but the book sounds really good. I'm excited to read A Blood Seduction! Amazing news from Brodi Ashton!! DIVINELY RUINED Blog tour stop! REST FOR THE WICKED by Cate Dean Promo Stop! ROCK OF IVANORE book blast!! SEVEN POINT EIGHT by Marie Harmon Promo Stop! HURRICANE by Jenna-Lynne Duncan Promo Stop! ASUNDER by Jodi Meadows cover reveal! Guest Post with Kate Salidas! And yet one more amazing deal!